There’s nothing finer than a large organ! 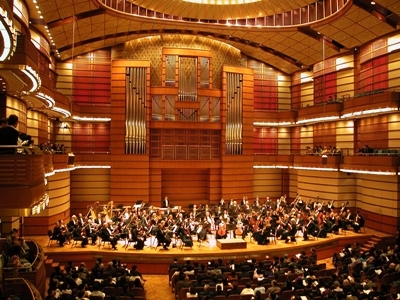 I’ve attended many orchestral concerts at the Dewan Filharmonic Petronas (DFP) but until yesterday had not managed to hear the organ. As organs go, it’s not the biggest in the world, but with almost 3000 pipes ranging in length from approximately 2cms to 10 meters, it is one of the most versatile. And I can now report that in the cozy surroundings of the DFP, it’s impressive, and loud! 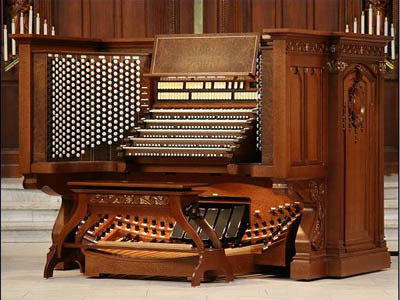 Just for the record, it was designed and built by one of the most eminent organ builders, Johannes Klais in Bonn, Germany. Opening the concert was Bach’s Toccata and Fugue in D minor … probably the most popular and best known organ work in the world. But yesterday’s concert had an interesting twist. The piece was played twice, without a break. First by the guest organist Olivier Latry, and then by the full orchestra. The second rendition was adapted for orchestra by the famous conductor and organist Leopold Stokowski. I’m not sure which one I enjoyed more. It was great finally to hear the power of the organ, but the orchestral version was highly innovative. For me, those twenty-five minutes were the highlight of the concert. Before the interval, the orchestra and organ played Marcel Dupré’s arrangement of Frantz Listz’s Fantasy and Fugue on the chorale “Ad nos, ad saluarem undam” … which just like it’s title, should have been a lot shorter. At least the finale was rousing. What was interesting though – to me at least – was that the organ was played from a second, detatched console, on stage, connected to the main console via a giant serpentine cable. Whenever I’ve seen organ and orchestra together, the organist – who normally has his back to the conductor – has played from the main console, watching the condutor through a mirror. It seems I should go to more concerts! Having the console on stage not only enables the organist to see the conductor, but it allows the audience to appreciate the amazing footwork of the organist. This guy would have rivalled Fred Astaire as he tapped away on the floor manual. The final work of the day was the 3rd Symphony of Camille Saint-Saëns, the “Organ.” I’ve listened to this piece many times, and I confess I was not aware the organ was used anywhere but in the rousing final movement. It is though played many times throughout the whole work, but in a way that blends with, rather than overpowers the orchestra. Maybe I need a better HiFi, or better hearing, because I also hadn’t realized there were two pianists in the orchestra for this work. But then, that’s the benefit of a live concert, especially in a hall with the excellent acoustics of the Dewan Filharmonic. In any concert hall you can appreciate the horizontal spread of the instruments, but in the DFP there seems to be a vertical spread as well, enabling the listener to identify each individual instrumement. If you haven’t been, you should. The range of concerts throughout the year covers everything from classics to jazz, and even family fun days. All of which proves, you don’t need a large organ to appreciate music.